Desperate times call for desperate measures. As Gujarat’s already acute water crisis takes a grim turn this summer, the authorities are scrambling for new ways to quench people’s thirst. The state government has announced installation of desalination plants; the Ahmedabad Municipal Corporation has said it would rope in experts for the facelift of Kharicut canal; and the Narmada Control Authority has said it has shut off Narmada water for agriculture in summer to reserve water for drinking purpose. While the fate of these measures is obvious, one wonders whether the authorities have tried taking lessons from the state’s own traditional water management system that had helped the arid region flourish and remain a centre of trade for 600 years. In fact, because of this age-old wisdom, several cavernous spaces in the twin cities of Ahmedabad and Gandhinagar can still be found brimming with water. These cavernous spaces are stepwells, or vav as they are called in Gujarat and baoli or bawri in neighbouring Rajasthan. Typically, a stepwell is a unique form of underground well architecture in which a long-stepped corridor leads down five to six storeys until it reaches the aquifer. The well, at the far end of the L-shaped structure, thus remains filled with clean and naturally filtered water throughout the year. 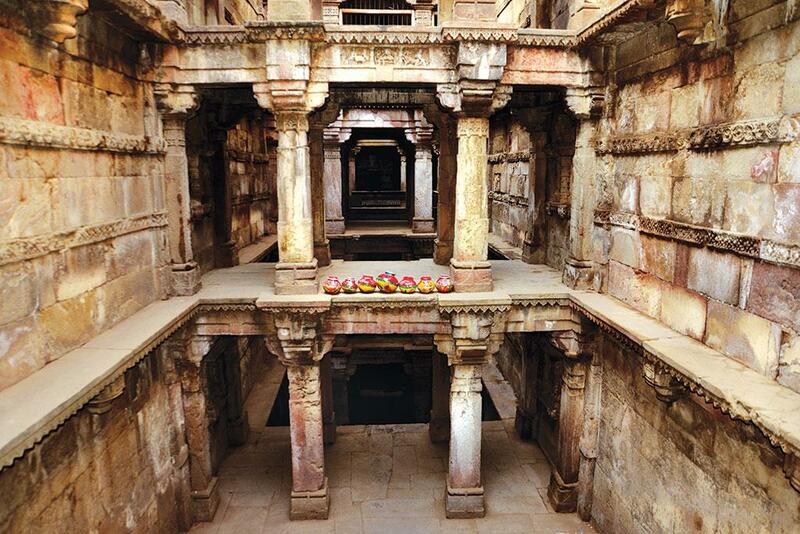 In Gujarat, stepwells are designed to offer more than water. While the tiered structure provides shelter from the hot and dry weather, the structure, usually made of brick and sandstone and lime mortar, keep the surroundings cool. 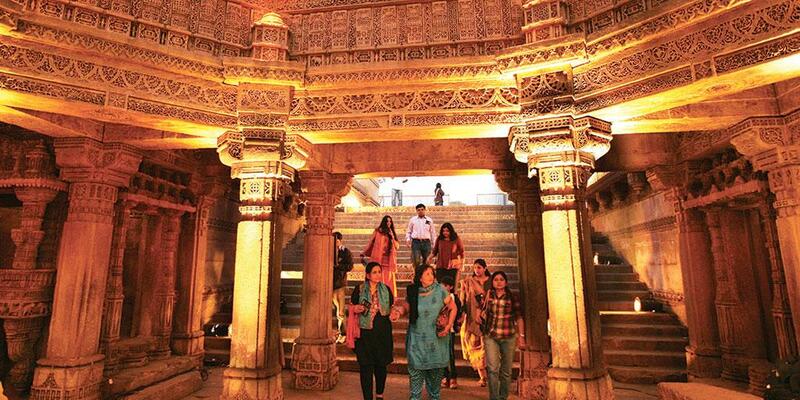 Small wonder, stepwells in Gujarat are located along important trade routes and near settlements, say researchers of Urban Management Centre (UMC) in Ahmedabad that provides technical assistance to city governments, who have recently identified 45 stepwells in Ahmedabad-Gandhinagar region. Built by wealthy traders and royal patrons, they are largely concentrated along routes passing the old city of Ahmedabad, through the ancient settlements of Vatva (now within Ahmedabad city), Mehmabad (now a municipality near Ahmedabad) and Uvarsad (now a village), they say in the book Lesser known stepwells—in and around Ahmedabad-Gandhinagar region. In fact, the earliest stepwells were built in Gujarat, which till today holds the title of “land of stepwells”. According to German art historian Jutta-Jain Neubauer, who in 1981 wrote The stepwells of Gujarat in art: A historical perspective and introduced the water monument to Western readers, “The oldest stepwells that are known are cut into a natural rock on a 1,000 m-high mountain range called Mount Girnar (Uparkot caves) near Junagadh in Gujarat”. The Uparkot stepwells date back to the 4th century and were built by Buddhist monks. Irrespective of when a vav is built, four structures are essential to its architecture. Todas are a pair of ornate pillars at the entrance to mark its location. Kutas are landings between sets of steps in a stepwell to provide a resting place. An ardhakuta is a supporting arch which has no landing or pavilion. Lastly, there is the well shaft, which contains or used to contain water. “Sometimes, there could be two well shafts. One would be used to lower the ambient temperature while the second would be used to draw water,” says Meghna Malhotra of UMC. Since a stepwell taps aquifers, it never went dry, she adds. However, its design is largely governed by the soil conditions and depth of water-table, say UMC researchers who have studied the designs of 30 of the 45 stepwells. One such is the Saiyad Hazrat Jalaluddin ni vav in Gandhinagar. Instead of the traditional stepped layout, this well appears to have an apartment like structure, with three levels stacked one above the other. Then there is Khodiyar Mata ni vav. Located in Badodara village, it is among a few that have been built within the basin of a lake and thus require reduced excavation to reach the water table. But today none of them are functioning. In areas where the water-table has sunk considerably, the stepwells have gone dry. In densely populated towns, municipal water supply has rendered stepwells useless which are suddenly remembered only in periods of drought. Others are being used as dumping places for garbage or for open defecation, or have been encroached upon by temples. Unfortunately, only seven of the 45 stepwells identified in the region have been awarded protection by either the Archaeo logical Survey of India or by the Gujarat Archaeological Department. At places, communities and organisations have taken it upon themselves to restore the crumbling structures, but only in vain. For instance, a stepwell in Ahmedabad’s Ensan village has been insensitively renovated with cement-plaster and paint. With ornamentation buried under layers of plaster, the arches have lost their original character and the toda does not have any distinct form left. 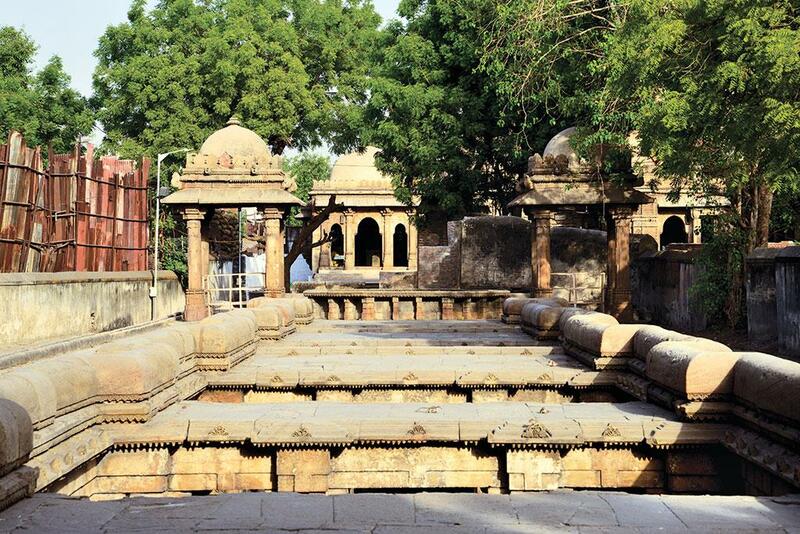 Another such stepwell is Khodiyar mata ni vav in Ahmedabad’s Devdi village. Jal Sampatti Vibhag (Gujarat Water Supply and Sewerage Board) has conserved this mughalera stepwell so well that locals use it as a resting place today. But in the process of restoration, they have covered the entire structure in cement plaster and whitewa sh. The stepwell now acts as a shrine, and porcelain tiles bearing the image of a goddess have been added in the niches. A stepwell bearing the same name in Vastral has been renovated by the admini stration of an adjoining temple with a steel frame and plastic paneling. All these prevent any accurate dating of the structure and makes it impossible to identify the original form of the stepwell. All one can see is a geometric pattern spiralling down. Another vav in Ahmedabad is located on the edge of a lake in Aslali village. Though it dates back to the 18th century, little regard was given to its antiquity while the Ahmedabad-Mumbai national highway was being built. A part of the road was cons tructed over the stepwell and the structure has been reinforced with concrete and cement plaster. The adjoining lake means that the water level within the well is still very high. However, due to the temple occupying the structure, the water has been polluted by trash from the devotees. Manvita Baradi, founder director of UMC, suggests ways to preserve these stru ctures. “The goal is not to freeze these step wells in time but to encourage a sensitive adaptive reuse of these beautiful structures by allowing people to find uses for them, like cafes, libraries and sit-outs,” she adds. But can the wells ever be used for water again? 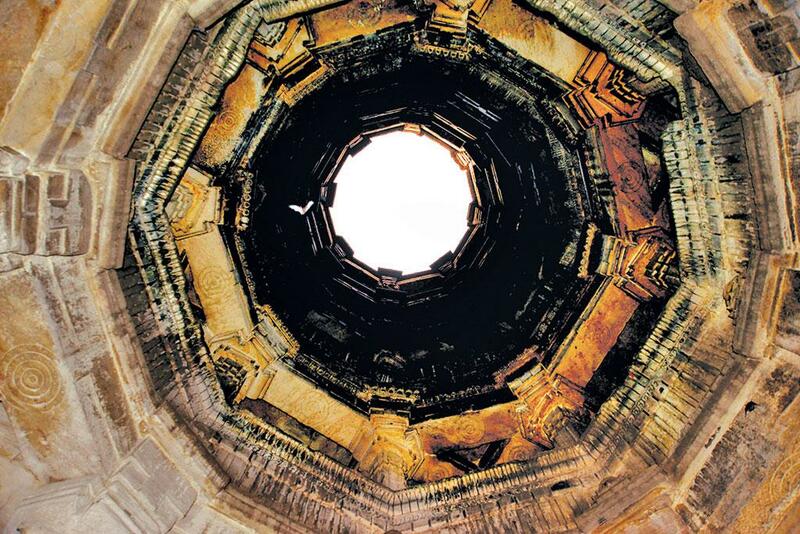 Purnima Bhatt, author of Her Space, Her Story: Exploring the Stepwells of Gujarat, has a measured reply. “It is not very likely that the stepwells would be used in the future for the purpose they were built, and the main reason is a large number of homes today have access to taps, tubewells and other sources of water,” she says. But it is possible to study these age-old water conservation strategies and learn how we can incorporate some of these ideas for community-based water harvesting, especially critical in drought-driven regions, she says.